Located at the end of the Florida Keys connected by road, Key West is both an oasis of calm and the launching pad for an exciting vacation. "Finisterre" is located in Old Town close enough to Duval Street to enjoy the many restaurants, bars and shops, but in a quiet residential neighborhood for those times when you want a break. The house and property, like so many in Old Town, has been through a variety of incarnations. The front of the lot originally held an old one story Conch cottage of modest proportions while the rear held a massive brick and coral oven which served the Cuban bakery located on the street behind. A few years ago the cottage was completely redone and now contains two bedrooms and two baths plus a delightful den which can be used as an additional sleeping area if you open the fold out couch. Connected to the cottage is a new addition which contains the kitchen, living and dining area. Off this space is the master bedroom suite complete with third bathroom. This configuration allows you to invite others to join your vacation while still maintaining some privacy from your guests when you desire it. Immediately behind the living and dining areas and accessible through four sets of French doors is the sun-filled backyard. To maximize its use your hosts lovingly dismantled the oven preserving the bricks and coral blocks which were reused to build a surround that houses the built-in gas grill, a gazebo with dining table, heated pool, outdoor shower and half bath. The entire property was replanted with native plants which provide a green and colorful backdrop for the birds and butterflies. 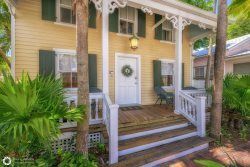 The house is an ideal retreat for a quiet break complete with four porches for private relaxing or a spot to entertain family or friends. Your host is a serious cook and the kitchen is equipped to make any aspiring chef happy. For those who like to be pampered there are numerous restaurants and nightspots within easy walking distance. Whereher you are looking for a place to get away from it all at "the end of the road," or a spot from which to launch the adventure of a lifetime, "Finisterre" will suit your needs. Bedding consists of a queen size bed in the master bedroom and master bath, queen size in second bedroom with private bath, two twin beds in thei third bedroom with a hall bath, and a full size pull out sofa in the office/library and hall bath. Certain pets will be considered for home stays in this beautiful home which is available only for 30 days or more.